Boris Gorodnitsky, a veteran pot grower of 12 years, remembers the time he had to fill garbage bags full of marijuana and throw them into the landfill. His crop had been reduced to a mushy, brown paste by a mold infection, leaving him with no choice but to toss it out, effectively doing the same with all the money he had invested in it. Gorodnitsky, who now heads New Leaf Enterprises and sits on the board-of-trade group seeking to change pot regulations, says the mold problem, and others like it, continue to persist despite the industry's new legal status and the host of pesticides and fungicides now available to producers. A ruined crop, he says, can easily cost a grower several million dollars, if not more. In response, the Washington and Colorado departments of agriculture, with the backing of the increasingly influential marijuana industry, are working with the U.S. Environmental Protection Agency to allow a broader range of pesticides to be used to treat legal pot. But the move has medical marijuana advocates and others worried that patients and consumers will be left with increasingly unhealthy pot. 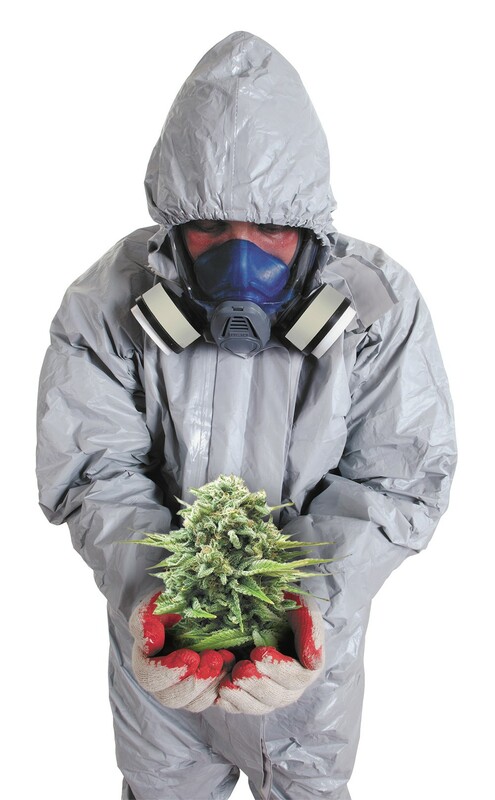 "It's a totally bad idea," says Gil Mobley, a Missouri-based medical doctor who ran a medical marijuana business in Federal Way, Wash., about new pesticides. This spring, Mobley conducted independent tests; he says they show that recreational pot in Washington is already laden with toxins. He points out that the Washington State Liquor Control Board doesn't currently test marijuana for pesticides, and he says the situation could get worse: "It's irresponsible. It's probably going to lead to lawsuits." Currently, there are about 300 pesticides and fungicides approved for use on marijuana in Washington state, says Erik Johansen of the state Department of Agriculture. Most of them, he says, are already widely used on a variety of agricultural products, and the toxicity of some is already so low that they can be used in organic agriculture. The EPA will sometimes allow states to develop their own regulations for pesticides in response to local needs, which it's doing for Colorado and Washington, says Johansen. Currently, he says, the EPA is collecting data from interested pesticide manufacturers to see what effects their products might have on human health if applied to marijuana. The new pesticides, depending on what the EPA concludes, could be approved later this year, he says. John Davis, executive director of trade group Coalition for Cannabis Standards and Ethics, says growers still struggle with spider mites, mildew, mold and other crop-ruining insects and fungi. "Some of our growers are looking for additional arrows in their quiver to fight those problems," says Davis. For instance, he says, some growers want to use pesticides such as spinosad, which is relatively nontoxic and can be used on a home garden or lawn. But the situation has others concerned. This spring, Washington Gov. Jay Inslee signed legislation that combines the recreational and medicinal marijuana markets under the auspices of the Washington State Liquor Control Board. The board is currently crafting regulations that will keep medical and recreational crops separate, but Christopher Brown, spokesman for the pro-medical marijuana Americans for Safe Access, worries that medically fragile patients could be exposed to unsafe levels of pesticides. Brian Smith, the LCB spokesman, says that marijuana is tested for potency, harmful bacteria, residual solvents and foreign matter. The board, he says, is working with the state Department of Health to begin testing marijuana for pesticides and heavy metals. Since 2004, Chris Van Hook has run the Clean Green Certified program, which gives a wide variety of agricultural products, including marijuana, a seal of approval that they've been grown without pesticides and in an environmentally and socially responsible way. He says that organic farming methods require more management, but can still produce world-class, award-winning cannabis. Others, like Gorodnitsky, still want to be able to use more pesticides.